ITW Finishing Technologies has announced the introduction of the new DeVilbiss VTX HVLP spray gun, specifically designed for applying stains. 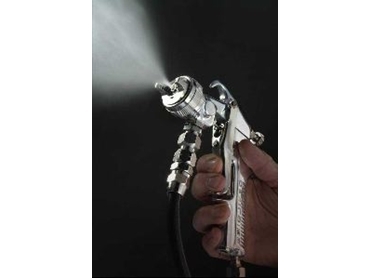 This spray gun uses newly developed, patented technology to achieve 99% colour repeatability, reduced mottling and haloing, whilst providing uniform, even coverage. Operator comfort is not forgotten either with 50% reduction in dynamic trigger pull. Working in conjunction with coating companies and furniture manufacturers, DeVilbiss engineers have designed an innovative solution to reduce the incidence of mottling, a cloudy or blotchy finish typically seen when spraying various non-grain raising dye, toner and semi-wipe stains with standard HVLP guns. The gun also achieves outstanding results when applying light to medium topcoats. * Highly consistent, uniform spraying patterns. * Virtually eliminated haloing in recesses, corners and mouldings. * Enhanced process control capability. * Improved finish, quality and appearance. * Additional operator comfort with 50% less trigger pull required. The VTX is designed to handle both thin and thick wood finishing stains and is the first DeVilbiss product to use patented Jet Impingement Atomisation (JIA) technology. In this process the stain is hydraulically pre-atomized in an internal impingement orifice, creating a vortex; a hollow fluid bulb is then formed as a result of the vortex; and the stain is finely atomised with the 2000 aircap and baffle combination. The three steps ensure highly consistent and uniform spray patterns. The VTX design also provides maximum transfer efficiency and complies with strict Californian air quality rules. "Free trials of the VTX gun will be offered, potential users should contact our office to experience first hand the difference a tool like this can make to the cost of applying stains" said Mr Stuart Walker - General Manager of ITW Finishing Technologies. The image below shows the difference in two timber panels. One (left) suffering the mottling effect described above and (right) when the same stain is applied with the new DeVilbiss VTX gun.